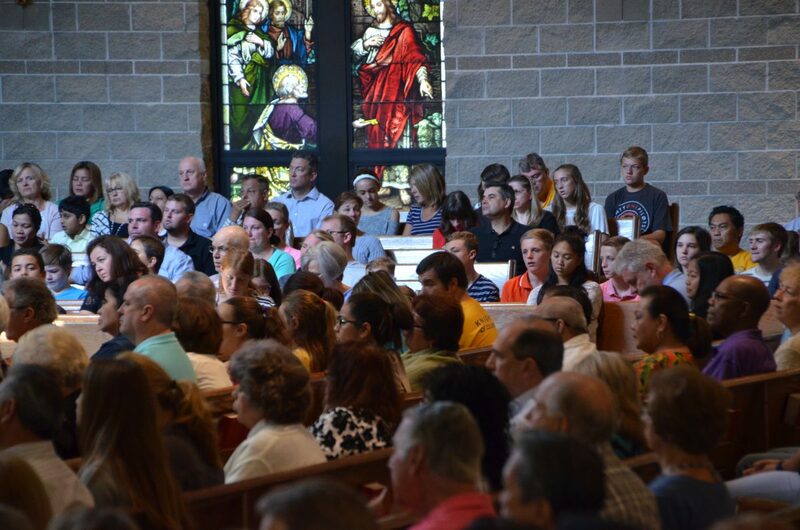 Visitors to Our Lady of Mercy are often struck by our beautiful stained glass windows. It is rare to find a newly built church with any stained glass at all, much less stained glass of such quality. 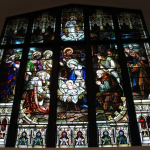 The windows and many of the Church fixtures are the gift of St. Augustine’s Church and Cardinal Bernardin of the Archdiocese of Chicago. The two large windows near the Baptismal Font are of the Nativity and the Ascension of our Lord. 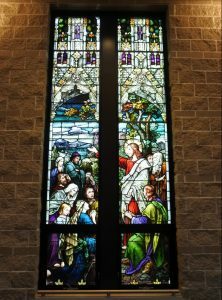 In the main body of our church there are 10 windows depicting scenes from the life of Christ arranged in chronological order. 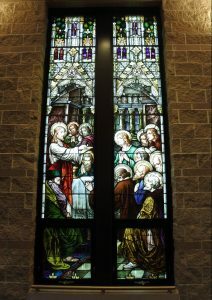 When facing the altar, the first window scene begin on the left side of the church with the window closest to the exit door weaving its way around ending at the St. Joseph side (the side where the piano is located). 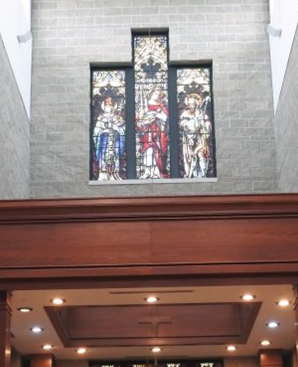 The two largest stained glass windows are in the narthex on either side of the Baptismal Font. Like most older churches, St. Augustine (from which the windows were taken) was cruciform, or in the shape of a cross. 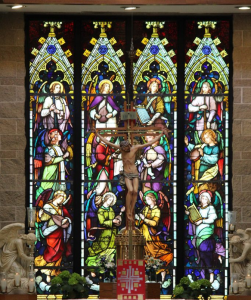 The “cross piece” of the church, called the transept, was the location of these two magnificent windows. 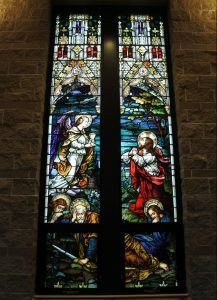 The window on the Eola Road side of the font depicts Christ entering our world at the Nativity. The bright colors of the robes of the Magi, on the left side of the window stand in stark contrast to the muted earth tones worn by the humble shepherds on the right. The other window depicts Christ leaving our world at the Ascension. Jesus, standing on a cloud and flanked by two angels, is at top of the center panel. He is surrounded by the apostles and His mother, Mary. 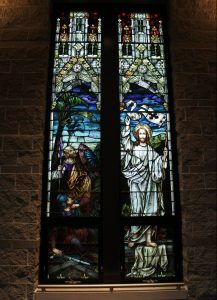 When facing the altar, the following tour of these beautiful windows will begin on your left starting from the Exit door and working its way around through the St. Joseph side, the side where the piano is located. This beautiful window portrays the archangel Gabriel who appears to Mary to tell her that she will bear a son by the Holy Spirit. Notice the purple coloring and texture of the angel’s wings are particularly beautiful. There is also a dove, representing the Holy Spirit, emitting a ray of light which illuminates Mary’s head. This takes place on the shore of Lake Galilee. See how everyone’s eyes are riveted on Jesus as He gives them the eight secrets to happiness. His audience consists of men, women, the old, the young, the rich and the poor, but they all find an incredible peace listening to Jesus’ teachings. 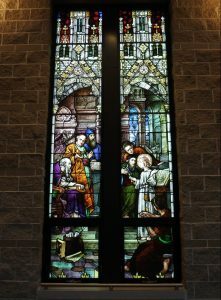 In this window, Mary and Joseph bring their firstborn son to be dedicated to God at the temple in Jerusalem. A prophet named Simeon tells them that the boy is the Messiah of the Lord. Note the rich drapery of Mary’s gown. Joseph is carrying a cage containing the required offering of two turtledoves. 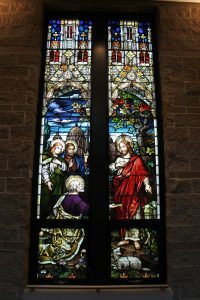 When you look at this window, you’ll find the group sits under an apple tree as Jesus teaches that “you must become like a little child to enter the kingdom of heaven”. Notice the peaceful faces of the mothers as they listen to Jesus’ words. Coincidentally this window is closest to our Children’s Chapel. The scene in this stained glass window portrays the biblical story of when Jesus was twelve, the family traveled to Jerusalem for a festival. On the way home, they noticed that Jesus was not with any of the relatives. They rushed back to Jerusalem and found the boy sitting with the teachers, asking questions and astounding everyone with his understanding. Particular attention should be noted on the Hebrew letters on the books and scroll. You’ll also find, as in the other windows, Jesus’ halo always contains a cross. 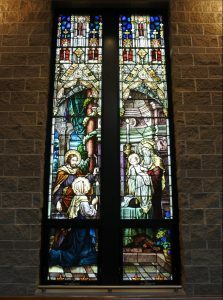 These next set of beautiful windows are located on the right side of the church when facing the altar, ending at the wall where St. Joseph is, the side of the church where the piano is located. The scene of the Last Supper in this window shows Jesus elevating the bread with a paten underneath. The cup is on a table in the background. The faces of the twelve apostles reflect their distinctive personalities and ages. Peter, an older balding man with a gray beard, is kneeling in the lower right portion of the window, while Judas (the only apostle without a halo) is seated in the lower left panel. There are lots of detail in this window. We once again see the wounds on Jesus’ hands and feet indicating that this is the risen Christ. While looking into the eyes of a kneeling Peter, Jesus points to three sheep, telling Peter to “feed my lambs.” Peter holds in his hand the “keys to the kingdom” just given to him by Christ. To further stress the idea of Peter as the first Pope, the artist chose as his background the basilica of St Peter’s in Rome. 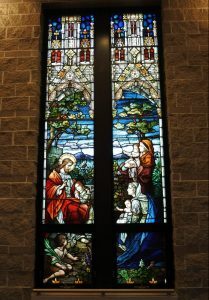 In this window, we find Jesus kneeling in prayer in the garden of Gethsemane. In the foreground, the apostles are asleep on the ground, notice Peter with a sword. An angel has come to minister to Jesus, offering him a cup. Especially beautiful is the background of trees against a starry night sky. 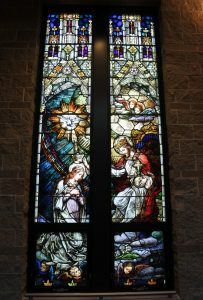 The beautiful scene this window depicts starts with Jesus seated on a throne wearing a crown and holding an orb topped with a cross, signifying dominion. With his other hand, he is placing a crown on a kneeling Mary, naming her Queen of Heaven. A dove, representing the Holy Spirit, is hovering nearby. The five chubby faces of the “cherubim” tell us that this scene is taking place in heaven. Jesus is emerging from the tomb. See how this beautiful window portrays His wounds; clearly visible on his hands and feet and he is dressed entirely in white. Jesus is carrying a banner signifying triumph. The two Roman soldiers guarding the tomb cringe in fear on the left side of the window, their swords, spears, and shields utterly useless against the risen Christ. 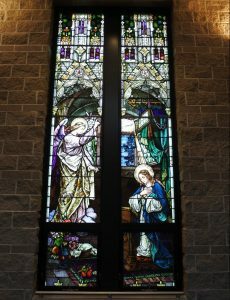 The windows which form a beautiful backdrop for the altar and tabernacle are images of angels playing different instruments, as a side note, there are also two of these angel windows in the Priest’s Sacristy. 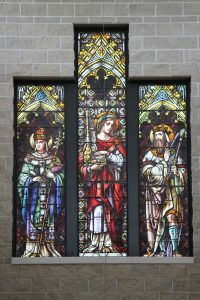 Then there are the three windows high above the tabernacle depicting three figures from our tradition closely associated with music, namely, King David, St. Cecilia and Pope Gregory the Great. King David [LEFT] As a shepherd boy, soothed his father’s sheep by playing his harp and singing. In this window he is holding a harp. The Old Testament reports that David loved to sing and improvise his own accompaniment. Many of the 150 Psalms are attributed to David. St. Cecilia [CENTER] is the patron saint of music and musicians. She was a young woman from a wealthy Roman family in the early days of the church when Christianity was an illegal religion. Tradition says she played the organ and sang continually in her heart to God. As a Roman Christian she was condemned to death. A soldier struck her three times in the neck with his sword, but she lived for three more days before she died, singing songs of praise to God.